Inferno Rush is proud to announce their first-year sponsor, Penn Medicine Lancaster General Health. LG Health Physicians Sports Medicine provides non-surgical care for a wide range of injuries to bone, muscle, and other soft tissues, along with concussion management and screening for cardiac issues in athletics. The caring staff is dedicated to providing the best services possible for our injured players whether the injury be as simple as a twisted ankle, or a torn ACL. Individualized treatment plans are provided to help their customers recover in the most appropriate way possible. An advantage to going to their Sports Medicine office at Kissel Hill (51 Peters Road, Suite 200, Lititz PA 17543) is that they equipped to handle everything right in that building. They are certified to perform musculoskeletal ultrasound right in the office, and sports rehabilitation (physical therapy) is available within the building, giving you better integrated care and added convenience. Penn Medicine LGHP Sports Medicine is very excited for our new partnership with the Inferno Rush. Here’s to a healthy and successful season. 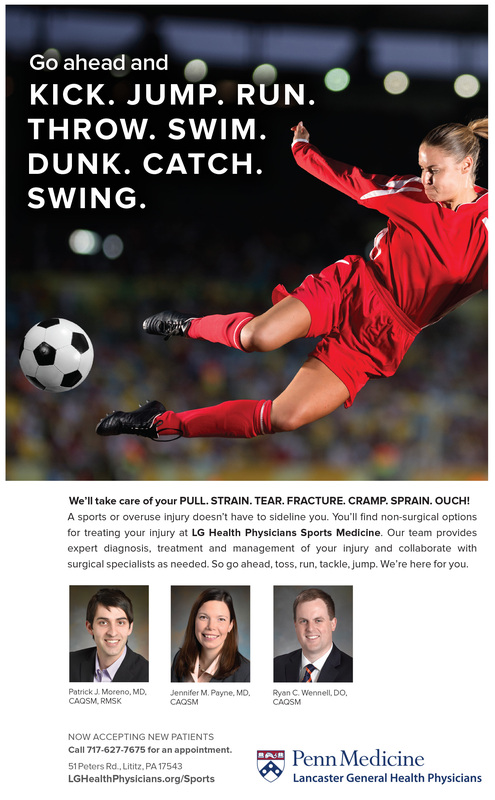 The experienced physicians at Penn Medicine LGHP Sports Medicine are fellowship-trained in sports medicine and have worked with professional, college and high school sports athletes, making them uniquely qualified to care for you and your family. We are excited to have them join our Inferno Rush family and appreciate the excellent job they are doing in keeping our team healthy and ready for competition.